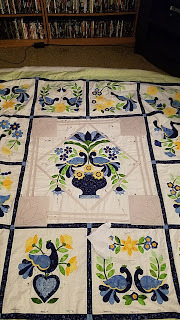 I have learned a lot about FMQ this large of a quilt and the detailed blocks. Pin the quilt to death. Really. I didn't do enough pinning with this quilt. 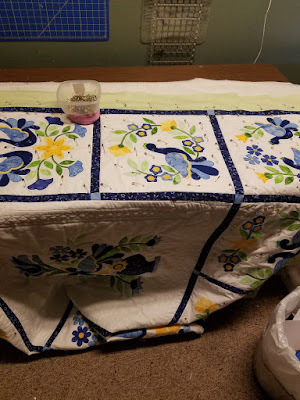 I only had a few days with my mom and really needed her help to get it ready for quilting so I used what I had. 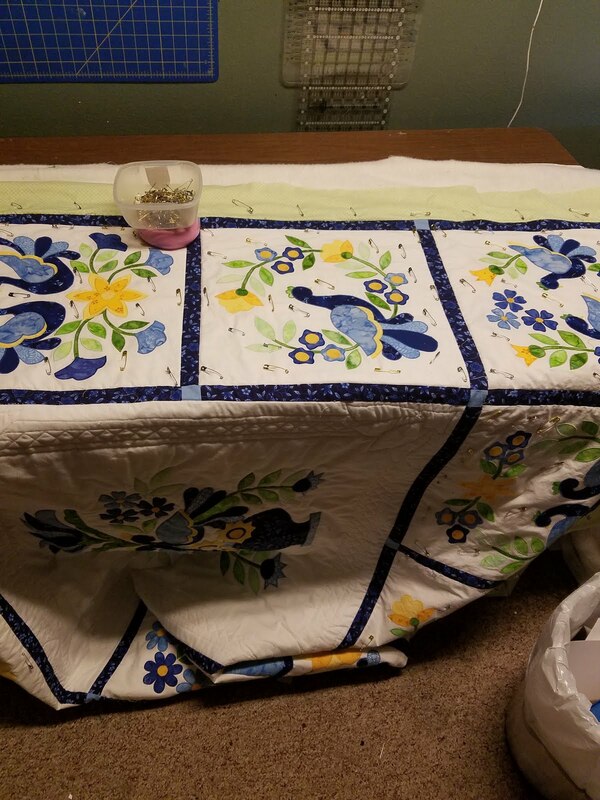 I watched a few YT videos and no one really showed how to pin this kind of quilt. 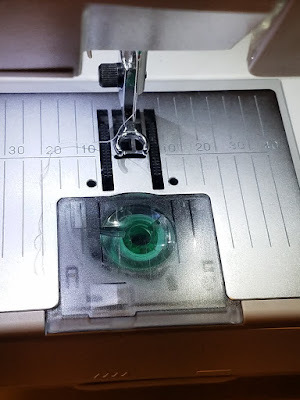 It was the basic start in the middle, move over 4 inches in all directions and work out. That's the layout I first used with my mom. Then as I got started quilting I realized how much this idea doesn't work on an intricate quilt. 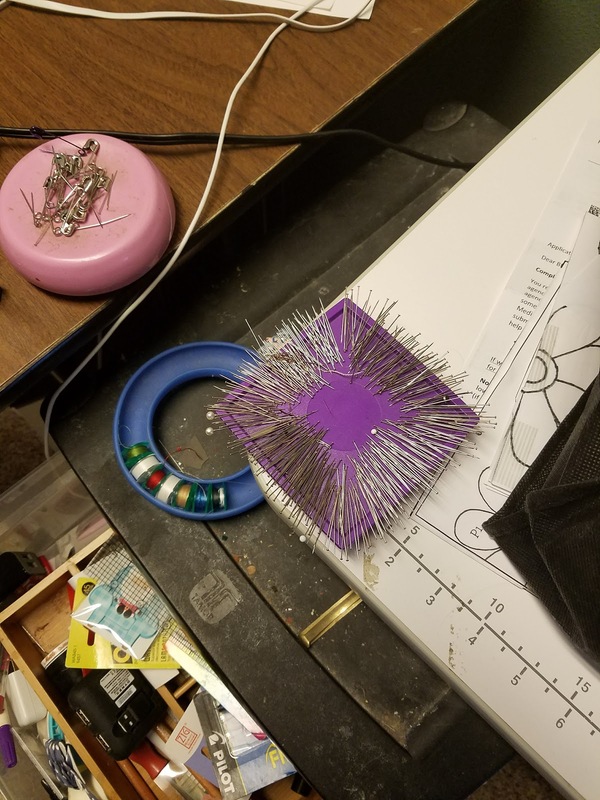 I needed pins everywhere. 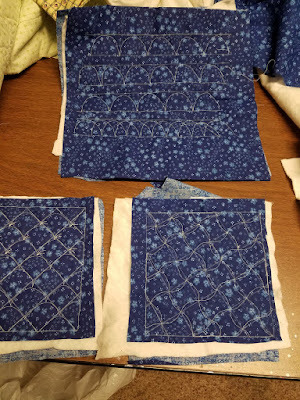 Today I spent the afternoon working on pinning the rest of the inside blocks for FMQ around the designs. Yes, the border needs pinned. My back hurts so that will be for tomorrow. I have a variety of pins. Some large, some small and some curved. I like curved pins, but they cost a lot. Use what you like. I'm torn between the two feet I have, a hopping foot and a FMQ floating stipple foot. A hopping foot drives me NUTS with all the banging up and down. However; it does hold the fabric in place while you go around the designs. 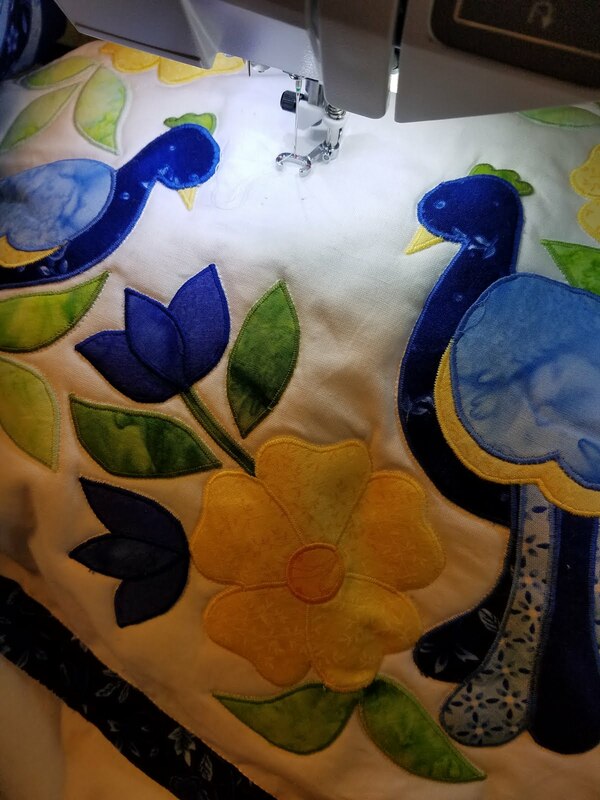 The FMQ floating foot is nice if you have excellent control of the fabric and speed as it "floats" along the top of the quilt. I think it's personal preference. What I do hate are the oval feet. I like circled feet. Note: If you buy this foot for your Husqvarna machine, it does hop until you reach the right speed. Maybe this should come first. Plan your quilt design. My center may need redone as it wasn't planned well. I came up with the pattern as I went and ended up ripping out corner flowers and had pleats when I did the lines. My quilted lines are NOT straight because I don't know how to make them straight. If you follow the sashing like I did, it isn't straight. 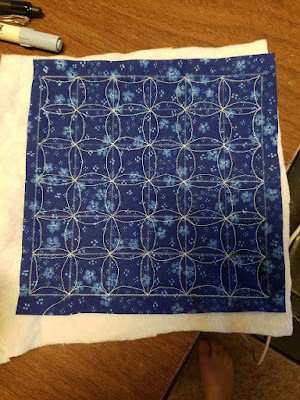 I have no idea how to keep a block "square" while you quilt. Being self-taught can be really frustrating. 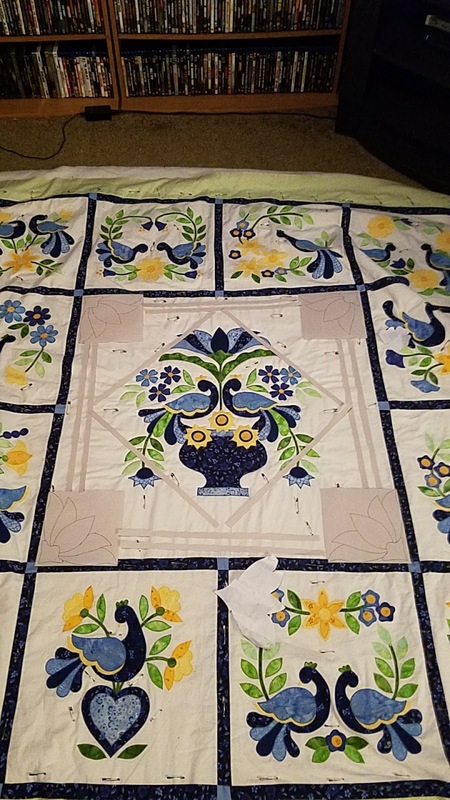 I'm sure if this quilt was on a long arm machine and basted correctly, the quilt sashing would look straight and so would the quilted lines. Had a planned better, this quilt would be done much faster and look much nicer. I am enjoying this quilt more. My FMQ stitches are nicer and I'm more confident in my ability to FMQ around anything after doing eight blocks. I really love my Designer Ruby machine for FMQ. I detest stitching in the ditch. Especially with this quilt. At least I didn't get any pleats or screw up the backing. 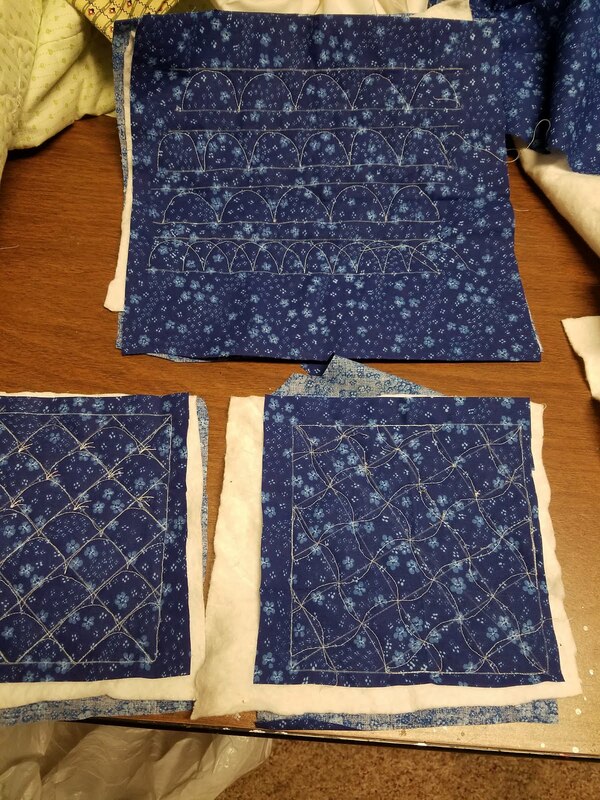 I finally got all that done and started in on FMQ the first of the outside blocks. Here's part of the center. I FMQ hatching between the spaces: You may need to enlarge the picture. 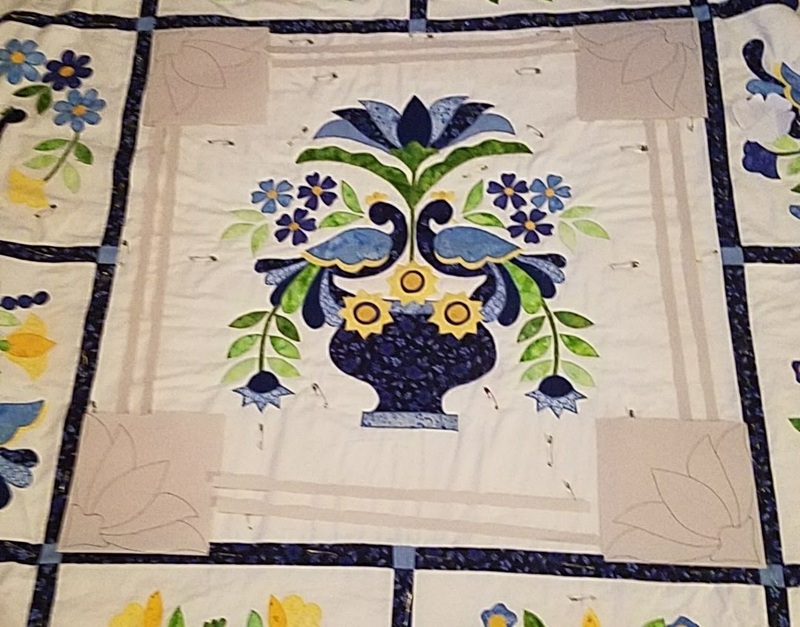 I plan on doing something in the center of the flowers after seeing the hatchmarks. 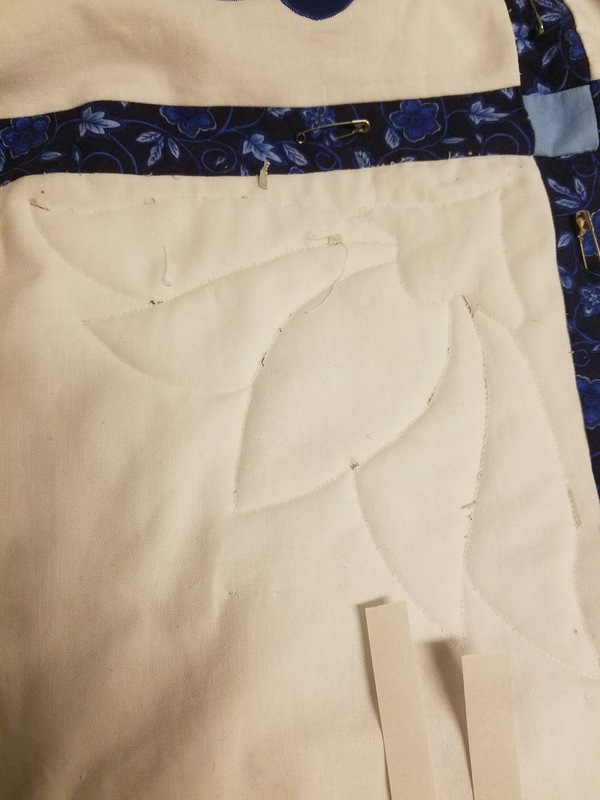 Note to self: Do better planning of how to quilt and mark so you aren't stuck. 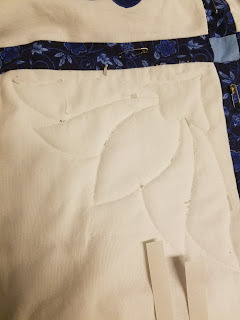 Since I haven't quilted in years, it's like relearning how to do it. Hmm. Purple marker disappears after a day. Good thing I didn't mark everything. 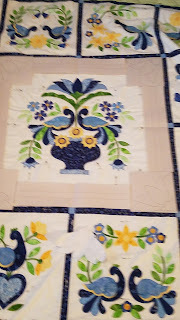 I did two of the corner flowers and I don't like the backtracking from FMQ. I hate to unpick the flowers, but it would look better if I stopped/started to make one single stitching line. On white fabric it becomes painfully obvious how well you FMQ. I'll think about it over the night and go from there but I'm pretty sure it's coming out. 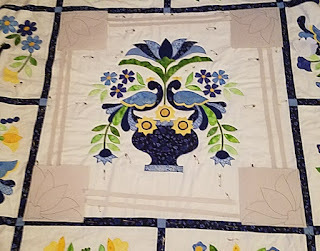 I fell in love with"My Tweets" an applique quilt by Erin Russek years ago and was determined to finish it. I thought this would be an easy project. I was wrong. In fact, I stuffed the quilt in a drawer and forgot about it. I hated it. I wanted to burn it but I'd put too much work into it. 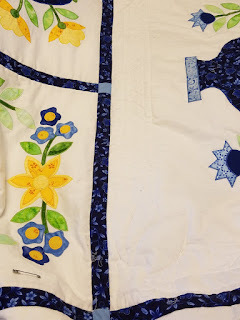 I didn't hate the pattern, Erin makes fabulous quilt projects so check out what she does. I just was overwhelmed all those pieces, reverse tracing, fusible webbing, multiple fabrics and then all the satin stitching. I didn't square the blocks correctly and everything was a mess. I had to redo the entire center because I messed up the background size. I got to the border and that's when it was stuffed into a drawer. The pattern was designed by Erin Russek around 2011 and it's now 2018 so that explains how long it's been stuffed in a drawer. It took a couple of years or so to get this far. Then my dad's wife came to visit and found the quilt. Her and my dad fell in love and asked if I would finish it for her. I agreed to finish it for her and my dad out of love. Here's the top w/o the light green border fabric. My mom was super awesome and helped me get it all pinned and ready to quilt. Now to choose how to quilt it. 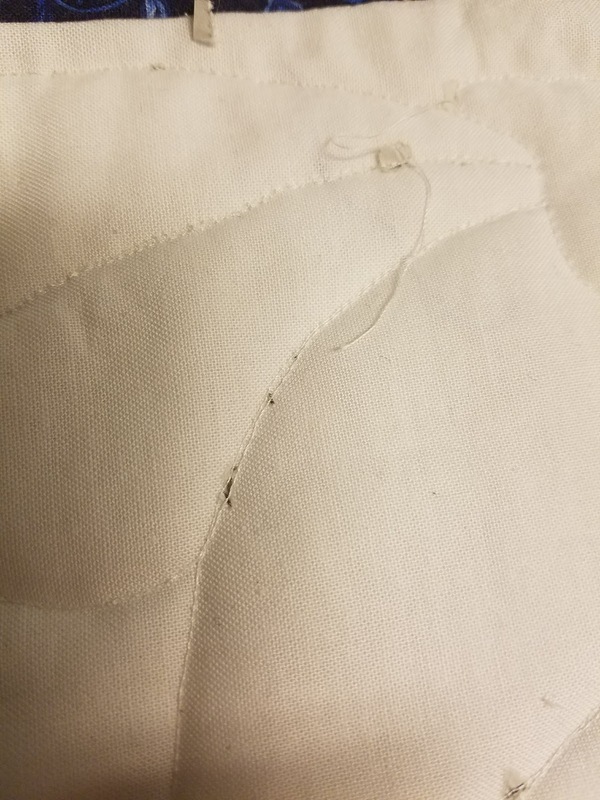 I haven't quilted in years. 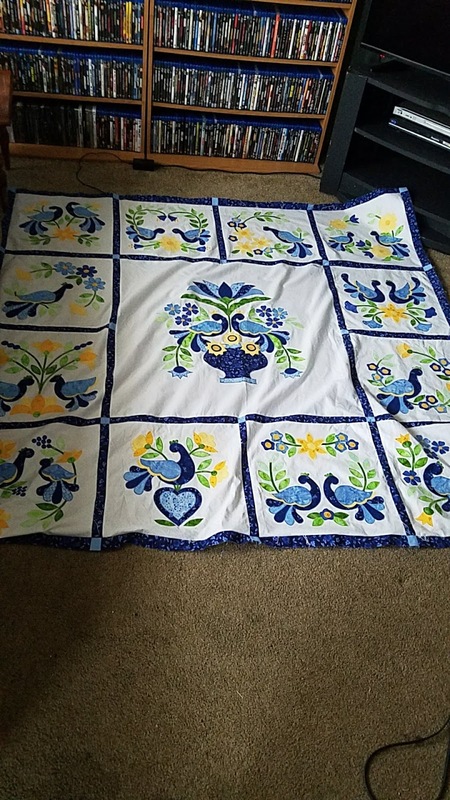 This quilt pretty much ruined it for me. I started making mini albums and gave up quilting. I haven't even posted anything for years. 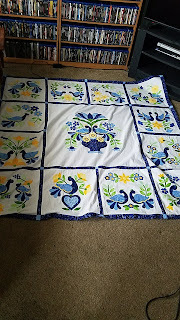 I wondered how other people had done their "My Tweets" quilts but only found two finished quilts. 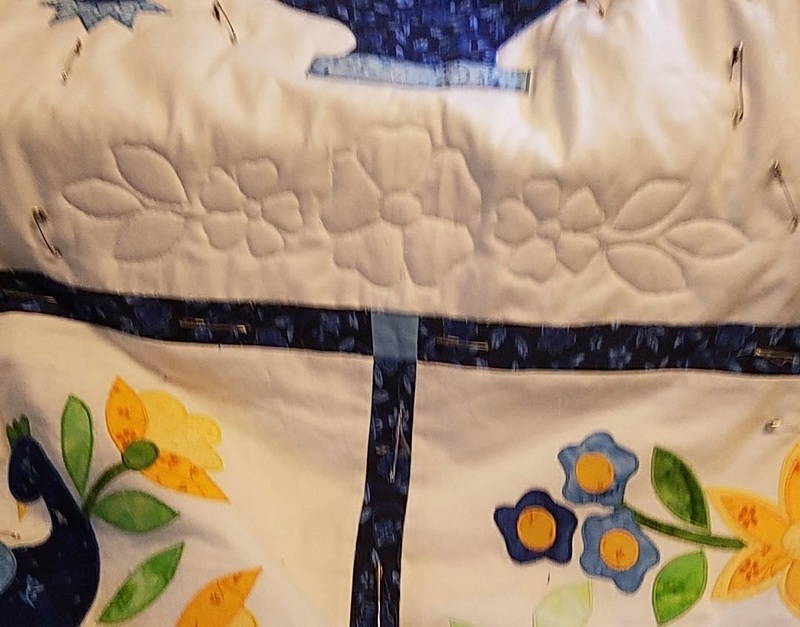 Both were beautifully quilted but beyond my quilting skills. I wonder how many others finished this pattern since I could only find two. My first thought was to use the flowers in the four centers until after I quilted the bottom and realized they were out of proportion and didn't fit around the centers as they were different widths. It's pretty, but I didn't like it. I spent yesterday ripping it out. I wanted the corners to be like the top of the flower. I put them in the corner and realized it looked like Art Deco. Cool. 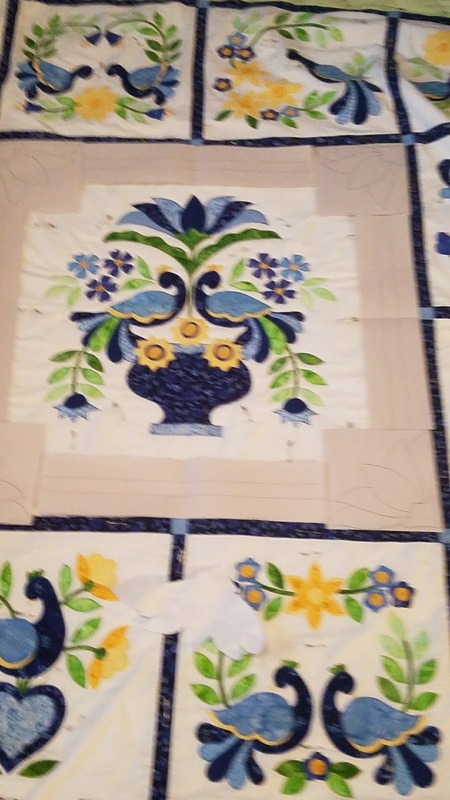 I then put a one inch strip around the borders to frame the quilt. It was out of proportion and I didn't like it. So I cut out two small 1/2 inch strips and laid them out like this. Much better. Now the center needed something else. I did a Google search on art deco but didn't find anything. I then had the idea to put a square on point in the center and sent a picture. My dad and Heather loved it. I still think it needs something else, but will figure it out later. Now to figure out how to mark it. Turns out tools for marking quilts hasn't changed. The usual blue pen (I don't dare because if I wash the quilt, it will probably turn blue), the purple pen and the chalk liners. Then someone brought up the Frixion pen by Pilot. Oh my gosh, the ink disappeared when I ironed it! Pilot was a genius. Awesome, except the lines come back if you put it in the cold and my background is white. I emailed the company and asked if they would make a pen like this for fabric. They said they'd look into it. This pen does have it's uses, but not on white fabric going to a loved one. Like others have said, use with caution and test your fabric as Pilot never designed it for fabric. I think my choice is the purple pen. Not sure how long this product has been around, but I LOVE it. The pins are so much easier to use and it's worth the 20 dollars I paid for it. Been super busy this fall. Decided to take two classes, Drawing 1 and American History before Civil War. For someone who is a quilter, you'd think drawing would be easy. It's not. My brain and fingers don't work together and it drives me crazy. I come home with a splitting headache every class. I like both classes but it's been very challenging. Not nearly as bad as the summer classes. I'll be brave and put up one of the bottle drawings. We had to cover the entire paper in charcoal and then "wipe" out the bottle and table. I have discovered that I hate stuff on my hands like pencil and charcoal. Clay is the worst. I don't even want my hands in it. Glue is just as bad. Go figure. Been working on some mini albums as well. This is the center page layout. I wish Graphic 45 had ribbon that matched their papers. They are the only company were nothing outside their line matches. I'll get some more pictures up in another post. I still have Mom things to do today. Past two months have been super busy and super hard. My son said, "Mom, you should go to college. You don't even have a life and don't do anything". Huh? I'm a mom. I clean house. I keep track of kids. I feed you. I am doing something..mom stuff you that don't get. But he got me thinking so I checked it out. We have a local college, Peru State 12 miles up the road. My son has taken online classes to keep up and I figured why not? So I enrolled. Ever try enrolling in college after 20 years? It's a PITA. They want transcripts from the colleges I was at. They want FASFA crap. They want tax forms. Then it turned out I applied at a college while living in Illinois when Peru ran a check. Ever try getting two colleges to communicate that I never went, but applied? It's horrible. Finally I told Peru to call up the other college and work it out since you have connections I don't. Once that all worked out I qualified for a grant. What they don't tell you is that grants are prorated for the credits you take. I decided to go part-time and my grant money was prorated for that. Why can't you just pay for two classes, books and a lab and then take the rest back? Doesn't work that way. So I decided to take an Art History class and Biology 101. I don't know what I want to be when I grow up and figured gen-eds would work. My college transcripts covered Eng 101 and a language. Another thing I learned the hard way. Summer classes are 16 week courses down to 8 weeks. Ouch. Got the books and purchased the online Biology Lab. Yup. You can do lab work online. Don't. Just. Don't. I spent HOURS doing labs that were only worth 10 points each. You could have 6 labs in one "class" and only get 10 points. Learnsmart Labs. May you die a slow and painful death. I like the idea of online labs. However; Learnsmart did a horrible job at user interface, following directions, not letting you know what you are doing wrong, and throwing fits over everything. "You have 4 numbers that aren't correct" which translates to start the lab over and over until those 4 numbers are correct. The last lab took 5 hours for 3 labs for a total of 10 points because I had no clue how to do a Hardy-Weinberg equation. Lab assumed you knew and gave no help whatsoever. 5 hours later and I'm a pro. Despite the labs, taking timed tests twice a week, 3 papers, online art field trips, Blackboard discussions (another PITA) and a TON of reading I have a B+ in Biology and an A- in Art Appreciation. Not bad for not having been to college in 20 years. I can't wait to get back into quilting and mini album making. Will I go to Fall Semester? Given the prorated grant money issue, I'm not sure. I refuse to take out student loans so I'll save up for Spring. Student loans are nothing by indentured servitude for the rest of your life. It's disgusting how that works. I think most of us have no problem paying a loan back, but being set up to fail is wrong. All I see is predator lending. BTW, Amazon.com lets you rent books for 3/4 cheaper than you local college. 25 vs. 80? Amazon.com wins.